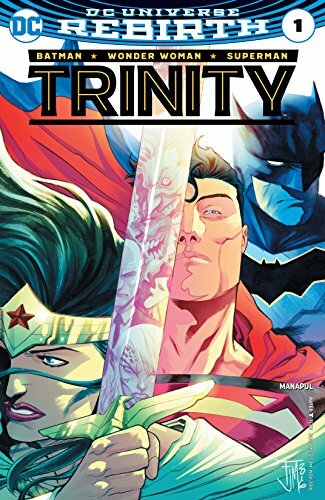 'Trinity' #1 by Francis Manapul is an essential chapter in DC Comics' Rebirth event. It bridges the relationships of the Big Three - Batman, Superman, and Wonder Woman. There hasn't been very much interaction between them since the relaunch but this issue sets the table, literally, for Bruce and Diana to get to know the new pre-Crisis Clark. This issue is all about character development and establishing a stronger bond between the world's finest heroes. Lois Lane initiates a dinner inviting Bruce Wayne and Diana Prince over to the farm to get to know the "new" Superman better. Clark is a little apprehensive, Diana is determined for conciliation, and Bruce is typically skeptical of everything. Both Bruce and Diana get grand entrances via clever splash pages from Manapul who pulls double duty as writer and artist. Diana looks majestic carrying a huge dead boar, her contribution to the dinner, and Bruce descending from his Bat-plane looks as dramatic as you'd come to expect. It quickly turns to your normal but awkward intimate family dinner with (super) friends. Instead of some great action-packed first issue, Manapul correctly builds on the foundation of these characters being friends, colleagues, and guardians of the earth. There was a much-needed dialogue between them, where Clark came from, Diana's new journey (directly from her ongoing series), and how Bruce relates to his young proteges. It may sound not sound compelling but Manapul does a superior job framing this encounter as a way to air out any questions between them allowing them to be more cohesive and communicative under this new Rebirth world order. It works because 'Trinity' reminds us why we care for these heroes in the first place. The book ends with a cliffhanger which is a nice hook but Manapul's art is enough to get us back for more. Mixing different mediums, Manapul presents each character in the best light. The lines are clean, the layouts are dynamic, and his colors illuminate the scenes with a sense of magic and nostalgia. 'Trinity' is just the type of slow jam Rebirth needed to rebuild the relationships between DC greatest heroes. We expected great art from Manapul but he also gives an earnest and endearing character-driven story that cements the future of Superman, Wonder Woman, and Batman as a team. It's unclear where the book goes from here but with Manapul at the helm I'm willing to find out.